As a person who has always enjoyed movies and with some formal background in film and audio/video technology (my bachelors degree is in Film and Television Production), I had always yearned for that "big screen" experience in my home. Back in the day (around the year 2000) the expense and technical know-how to produce such a feat was beyond my reach. 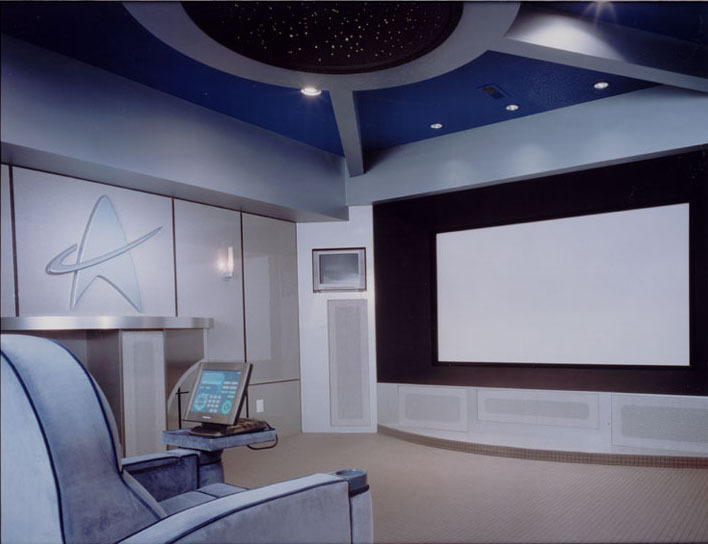 In late 2002, I became aware of the new developments in the area of home theaters and digital video that would finally allow me to indulge my love of the big screen and science fiction, in particular. Aside from building a "traditional" home theater, I needed some inspriation to make the leap from dream to reality. That inspiration came one day while culling through one of the fine home theater magazines. 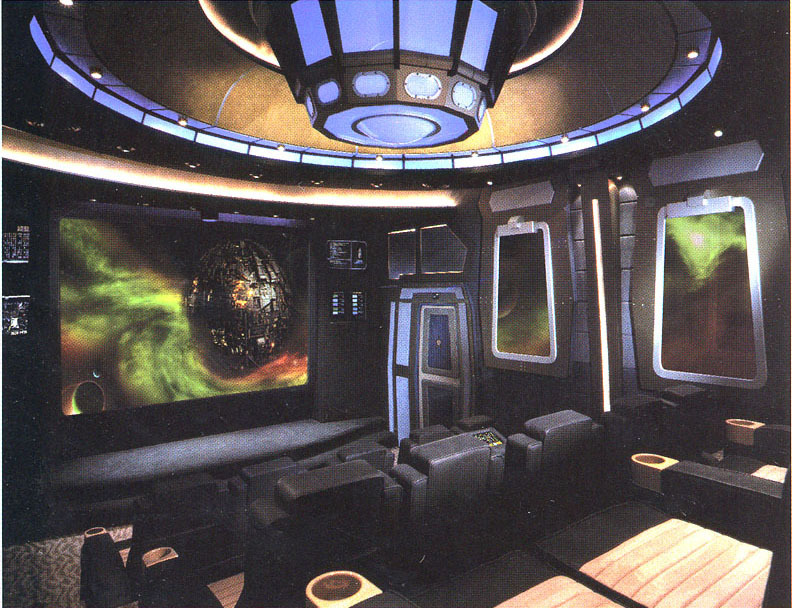 I had come across a room that merged my interest in movies with my love of all things science fiction. 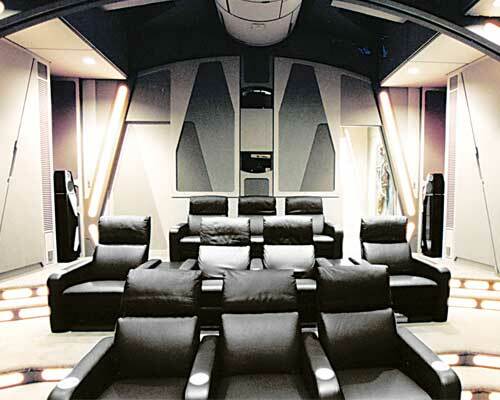 As a result of seeing this home theater, I thought, this is something I would enjoy designing and building. However, that desire (along with what my concern for what the costs of these custom rooms were) was not strong enough to kick me into action. Now here was the inspiration to do something unique with a sci-fi theme, if only I could afford to do something like that. But what about the video projection equipment required? Around the year 2000 I was under the impression that to produce a quality image on a large screen at home would run upwards of $50,000 for a three gun CRT-based unit. Quite unexpectedly, (I swear!) I received a flyer from Epson for their new (at the time) TW100 home theater projector. While I had used digital projectors at work, they were barely adequate enough to handle a PowerPoint slide, let alone a high definition video image. Yet here was a projector for under $5,000 (cheaper than a 42" plasma display at the time!) 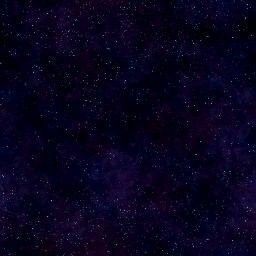 that promised a large, detailed, colorful high-definition picture. If this was true, maybe there was a chance. Thus began my introduction into the whole world of bulb-based fixed-pixel LCD digital projectors. My research into these units soon showed that even for considerably less that $5,000, one could obtain a projector that would produce a stunning picture from a DVD or high-def TV source. That did it and my project began. 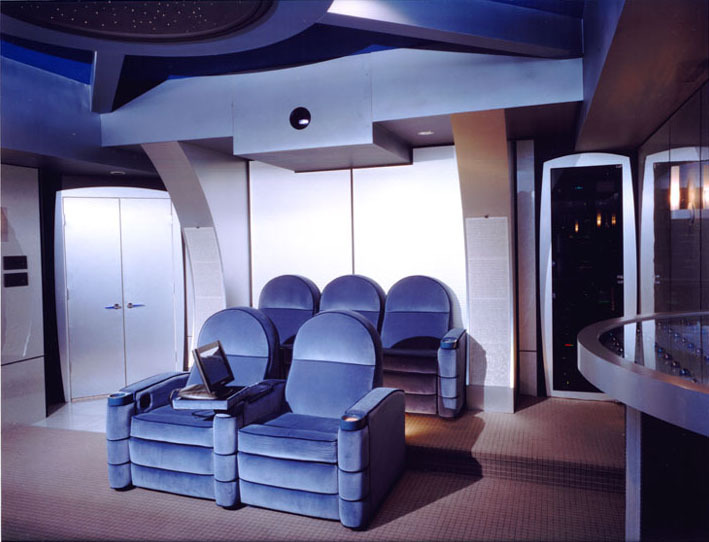 The best piece of advice I can offer those of you planning to pursue your own development of a home theater is to visit the AV Science Forum. No single source can provide you with more information, help and advice. The folks there are friendly and extremely talented. You will be amazed at the quality of the work done by these 'amateurs'. Their advice was invaluable during the construction of my theater. You can find the forum at www.avsforum.com. This web site represents my journey through the process of designing and building my theater, in all a two year effort from start to what you see in the finished photos. This project employed a complete do-it-yourself approach to minimize expenses. My limited budget (~$16,000 for room and all equipment, furniture, etc.) dictated certain compromises that those who construct more expensive rooms would not tolerate. 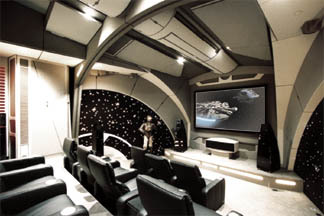 Therefore, while I do not consider my theater state of the art (I do not employ top shelf equipment or cutting edge acoustical treatments), it does represent what a person can do on a very modest budget to produce an enjoyable and unique space. I hope you will enjoy taking the journey again with me. 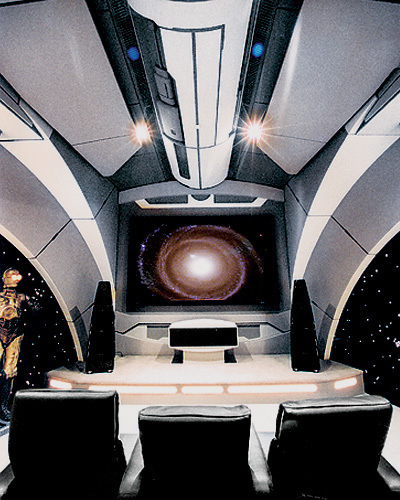 Here is a photo of a "Stargate" inspired theater from the January 2003 issue of Audio Video Interiors magazine. 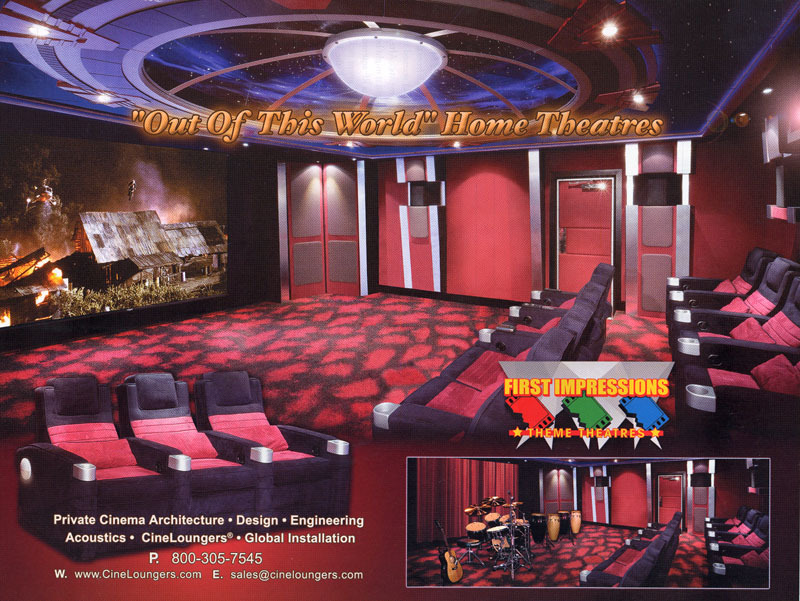 Another beautiful theater by First Impressions Theme Theaters. 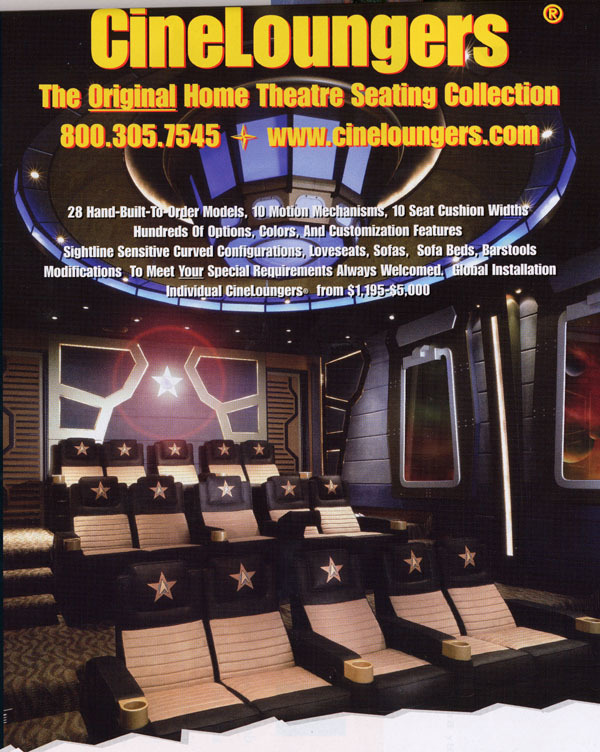 The Death Star Theater, a "Star Wars" themed theater, was professionally custom built as the centerpiece of a couple's home by Dillonworks. 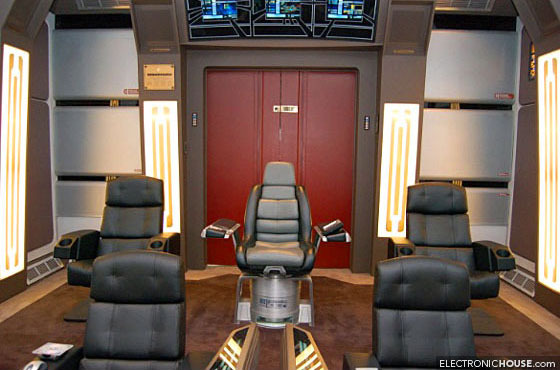 It is probably the ultimate (and one of the most costly with estimates running to $250,000) sci-fi themed theater. Check out this site for more pictures Dillonworks. 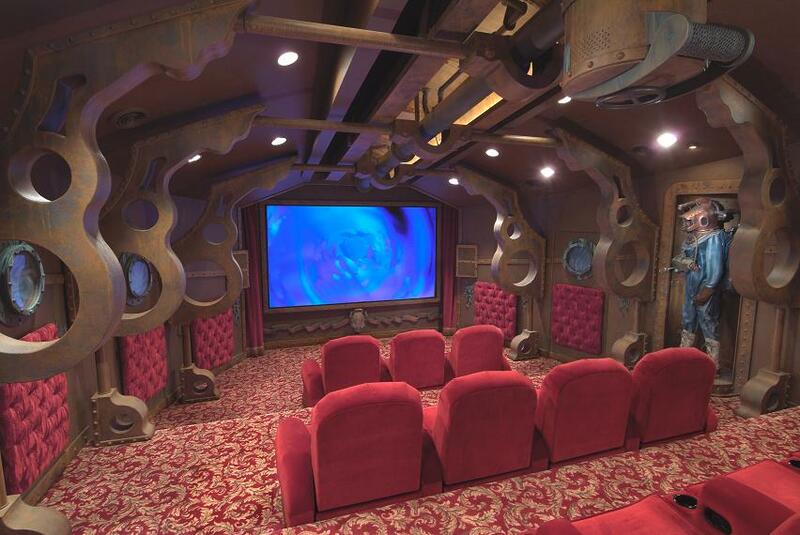 Below is another outstanding themed home theater also built by Dillonworks. 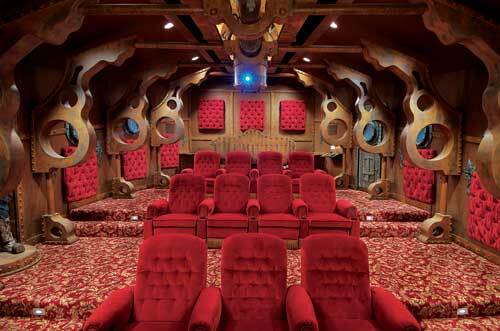 The theater is modeled after the Disney version of Jules Vern's Nautilus submarine from 20,000 Leagues Under the Sea. The Cyberdyne Cinema, a "Terminator movie" themed theater. 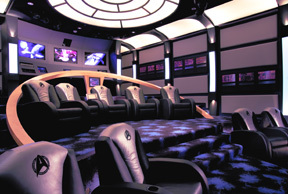 The Jedi Theater, a "Star Wars" themed theater. 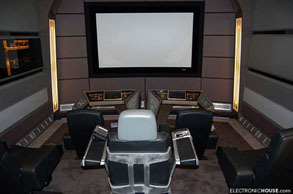 Here are photos of another "Star Trek" inspired home theater from 2001 designed by Audio Advice. In 2006, two years after finishing my theater, I found what has to be the ultimate Star Trek home theater (not to mention just the ultimate HOME theater!). Click the photo below to learn more about this incredible $3 million dollar theater!